A special 316 page book to celebrate the 90th anniversary of the Revue. It includes a synopsis of the history of the revue, with small vintage photos. It covers the years 1994 - 2003 in more depth, with show information, events, new members, retirements, posters for all shows, etc. 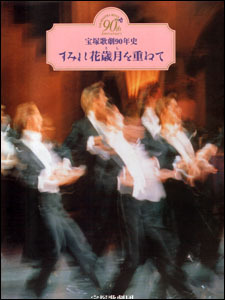 The book also includes lists of the stage names of every Takarasienne since 1914, and every major show put on by the revue. There are also small pieces of information on things like nicknames, shinjin kouen origins, etc. Created by caithion. Last Modification: Sunday 27 of April, 2008 06:43:20 PDT by caithion.